Blachford Lake Lodge is situated in pristine Canadian wilderness, perfect conditions for viewing the Aurora Borealis (photo: Martina Gebrovska). It’s worth heading into the wilderness from Yellowknife for a few nights to enjoy the silence, get a crick in your neck – and witness the Northern Lights cosmic light show like you’ve never seen before, says Birgit-Cathrin Duval. There is really no reason to fly to Yellowknife. This oddly named city is not on any well-trodden tourist route, being north of the 60th parallel in the Canadian Northwest Territories and pretty far away from everything. 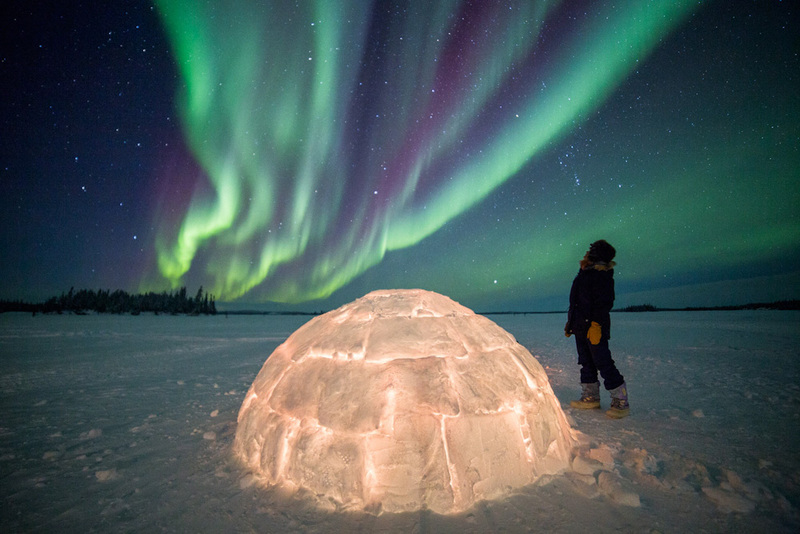 Life is lonely here all year long, and ice cold during winter, but Yellowknife has one very special, otherworldly talent to show off to those who make the pilgrimage. Nowhere else in the world are the Northern Lights as intense, vibrant, and spectacular as in the Northwest Territories – well, so reads the travel guide anyway – especially if you visit in the peak viewing time of late August through to mid-April. I’m going to find out for myself. What causes the light show? The phenomenon is caused by the aurora belt, an electromagnetic field floating like a halo over the Earth, hundreds of kilometres above the North Pole. When the charged solar-wind particles reach the atmosphere, they cause the air molecules to illuminate. Polar light activity is highest in this belt, which stretches from the 60th parallel to the Arctic Circle, and the city of Yellowknife is right in the middle. While I’m preparing for the night to come, I meet Goota Ashoona, an Inuit artist who practises the centuries-old family traditional sculpture in her Ashoona gallery, based in a small, rickety cabin in Yellowknife. The spellbinding Aurora Borealis seen from Blachford Lake Lodge in Yellowknife, Canada (photo: Martina Gebrovska). She tells me about being touched by the Northern Lights as a child. She claims to have even heard the gusts of heavenly wind. Can you actually hear the Northern Lights? I can’t wait until night falls to find out. Even more mystical is the indigenous legend that claims that the Northern Lights come from the eyes of deceased animals that granted their eyes to the heavens in order to light the way for mankind. But as night falls, and wears on, no glowing wolf eyes appear in the night to light my way. The sky remains pitch black. The following night pulls the same trick. After two nights remaining awake without any sign of the lights on the horizon, I want to finally see the Aurora Borealis dance across the arctic sky – outside of the city, in a special place only accessible by seaplane. There are numerous ‘fly-in’ log cabins around Yellowknife, which cater specially to hobby fishermen. For the most part, these cabins are simple, yet functional. Blachford Lake Lodge, on the other hand, is a five-star facility in the middle of this pristine wilderness. A 45-minute flight from Yellowknife, it perches on a rocky outcrop of an island like a castle, surrounded by nothing but water and forests. When Blachford’s owner, Mike Freeland bought this land 30 years ago, there was nothing here but a few cabins. He built the lodge himself and opened it to the public in 1999, offering numerous cabins to allow self-sufficient trappers to structure their own trips. A crackling campfire keeps visiters to Blackford Lake Lodge toasty warm (photo: Tessa MacIntosh). Mike and his wife Tessa place special importance on ecological management, beginning with their meals and ending, so to speak, with composting toilets. But there is no need to give up comfort. There is wireless internet, a bar, a lounge, even an outdoor jacuzzi, plus a chef and full culinary team standing by to tend to the guests. It is luxury in the heart of the wilderness, and the lodge has become popular as a corporate retreat – no mobile phone service can help relax the most stressed-out manager. There is pure wilderness here – wild bears and wolves included – and the list of activities is long, from hiking to fishing in summer, to dogsled tours, snowmobiling, and snowshoe hikes in the winter. Late in the evening, Mike lights a campfire in front of the cabin. Once again, I have to be patient. The starry sky unfolds above me like a glittering panorama, almost intoxicating but still blacker than black. Stars glitter like diamonds embedded in black silk as the hours pass, and it isn’t just the fire that is waning. The guests retreat sleepily into the building. Mike promises to wake them if the Northern Lights appear. Then I sit there, alone under the sky, so large, so broad, so dark, and almost fear that it could come crashing down and swallow me whole. It is long past midnight when something appears in the sky – a mist so thin, at first I think my eyes are playing tricks on me. And then the sky seems to explode. My cry echoes through the night, and everyone wakes up and rushes outside. “They’re here, they’re here!” I shout. Veil upon veil of light darts across the sky, reflecting its brilliance in the water. Sometimes they hesitate as if watching us, and then suddenly change shape and take flight. Spirals and ornaments appear, as if drawn by spectral hands, and dance across the horizon. Then they collapse and reappear in a new place. An inferno of light, milky white to sparkling green, glitters in its course across the skies in a magical collision of the elements, an overture of the North, a window into a new dimension. We stand there, agape, finding no words to describe what is unfolding before us. My skin tingles. It feels as if the air is crackling with electricity. Or is that just the excitement of being a silent observer to this phenomenon? Could Goota Ashoona be right? The Aurora Borealis seems to have got under my skin. It feels as if I’ve been kissed by the heavens, and I wish the daylight would never come. Looking for more amazing things to do in Canada?